Plumbing cross connections are actual or potential connections between a potable and non-potable or unapproved water supply and constitute a significant public health hazard and are controlled by the use of backflow prevention valves. 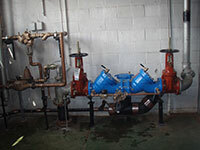 This program protects the public water system from contamination by an unapproved water supply by requiring installation and testing of backflow prevention devices (double check valve assemblies and reduced pressure zone backflow preventers) installed on the public supply lines where they enter facilities, generally near the water meter on domestic lines and before the alarm check and siamese connection for fire lines. Testing must be completed by a certified tester with a valid backflow prevention device tester certificate (see below). New Jersey regulations require a physical connection permit be obtained by the owner of a facility containing an unapproved water supply and a public community water supply (Permits are not required for private residences). The permit has to be renewed annually and requires each backflow prevention device covered by the permit to be tested quarterly. To apply for a Physical Connection Permit, complete the appropriate application forms (below). Further information on cross connection control is available in the EPA Cross Connection Control Manual (below).